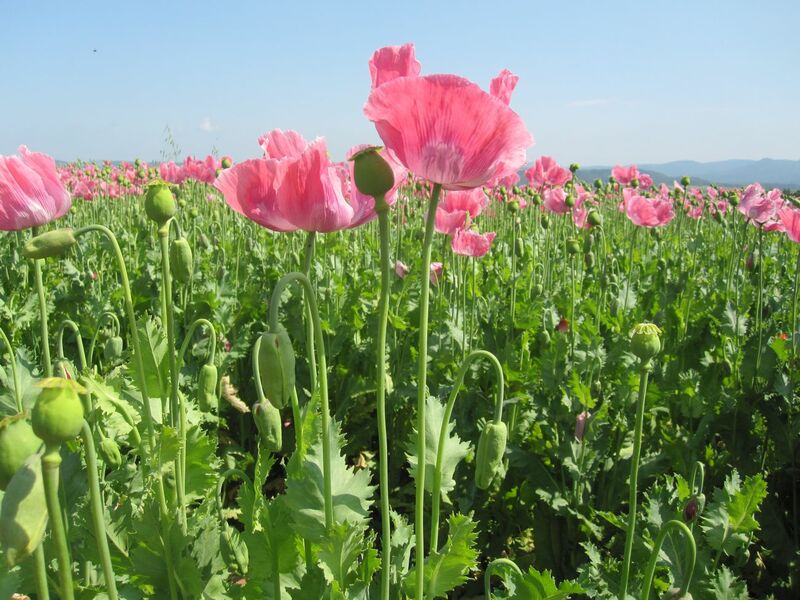 Some years ago a farmer cultivated opium poppy in the fields of the Meißner Germerode region. 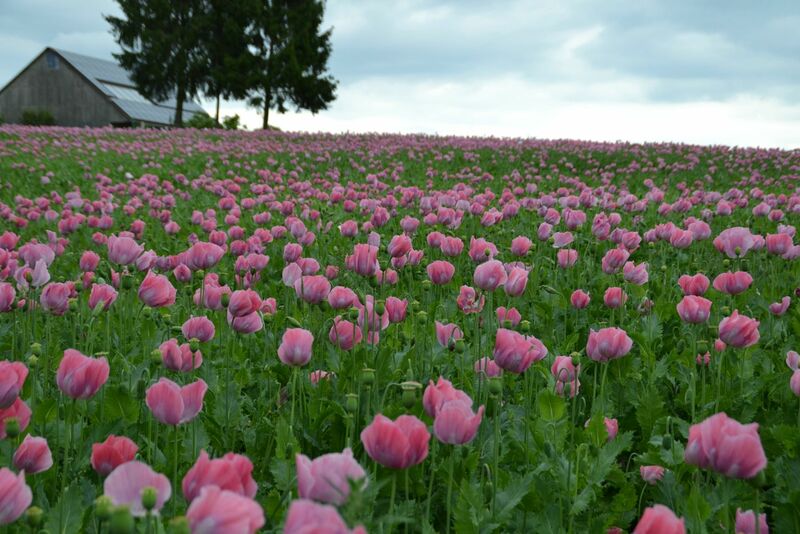 Because the fields in June/July are so spectacular with blooming poppies, the Naturpark-Meißner-Kaufunger Wald publicizes association this regional show of nature. 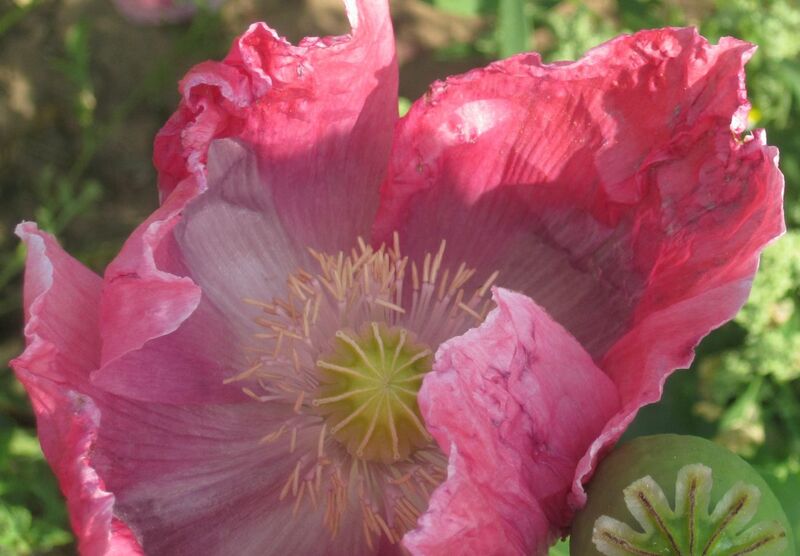 The bright flowerage, the filigree stamens, the gossamer petals, the plump buds and the striking seed pods present an impressive picture and are a joy to behold, bringing a true sense of awe to visitors. The fields of our beautiful highland countryside, with pretty walking trails and delightful panoramic views, gleam with intense pink. Especially made and well marked trails cross the sea of blooms, allowing close contact and complete immersion into this unique nature experience: bumblebees, bees and small insects hum and flit from flower to flower. then one can see into the opened bloom. If the petals have dropped, one can see the massive seed pods and the whole plant unit. To see the blooming poppy plants in all their stages is an awe-inspiring experience. 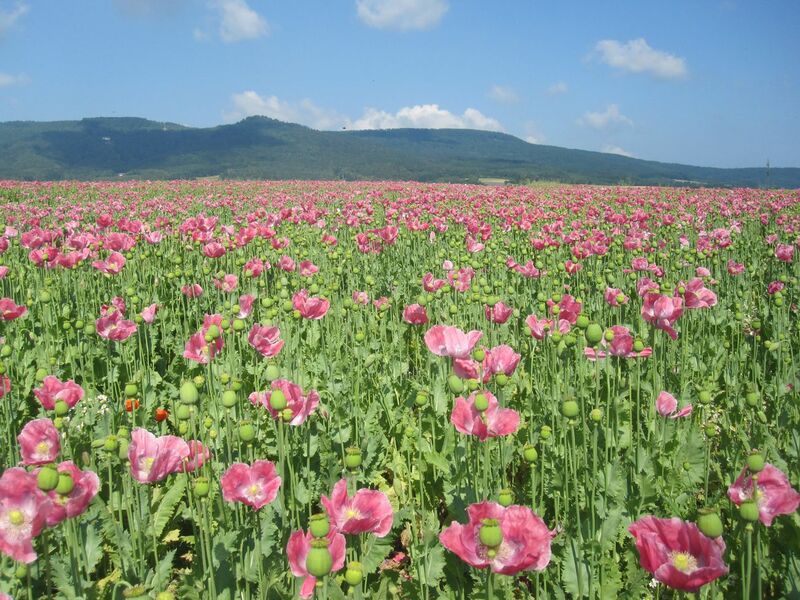 For years now, during the poppy-blooming season, I have visited the picturesque surroundings of Germerode, with the Meißner montain in the background, to enjoy the spectacle. Last year, the grand trip inspired me to take the shapes from the poppy field and to use them as outlines for whitework designs. Wouldn’t it be pleasant to come back to a smartly laid table and to present the poppy cake on a well-ironed white linen cloth embroidered with poppy motifs – the treat would be double! My ambition was aroused, but to transform poppy motifs into embroidery designs is not an easy task. 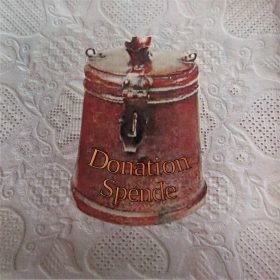 There are some well-known coloured Cross stitch designs (I think especially of Thea Gouverneur’s, “Secret Garden of Cross Stitch”), but poppy designs in whitework, especially in the technique of Schwalm whitework, were not known to me. 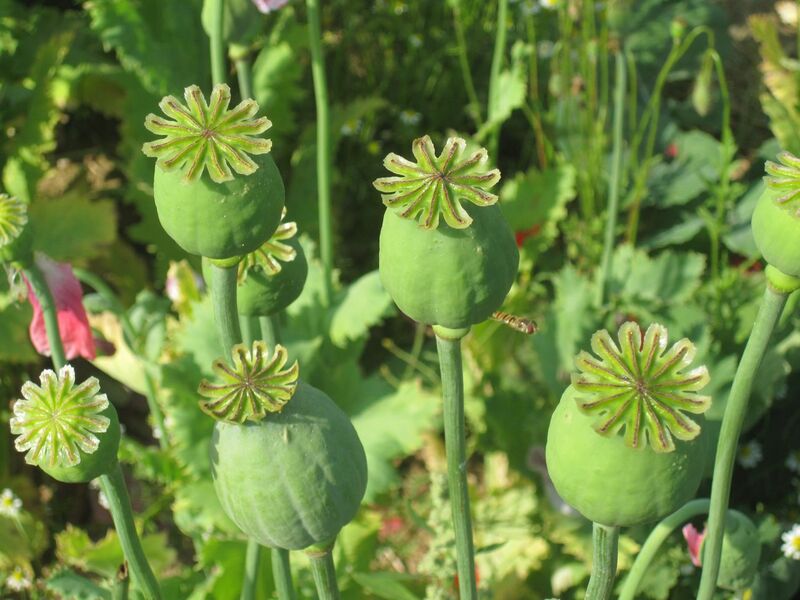 Henceforth, I kept my eyes open and found, in the technique of Hardanger embroidery, stitched motifs which looked to me to be poppy seed pods. And there are a few more whitework and other white needlework which could portray the poppy. I submitted my ideas to different designers, and asked them for help. As a result, I got some beautiful motifs which I am embroidering now. One worked white, but not in the technique of Schwalm, is nevertheless very lovely. Another, worked in the Schwalm technique, is gorgeous. You will be able to see the upscale artistic designs and the finished embroideries in the “summer resort” area of my exhibition “Noble and White“. 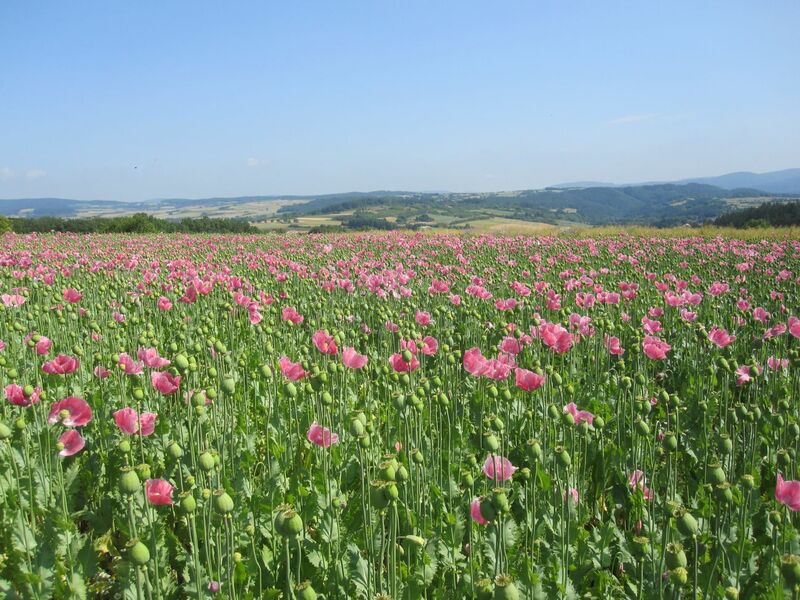 Of course the poppy-themed embroidered pieces are too few to fill an entire room in the exhibition, so one will also be able to find many more pieces with other motifs. 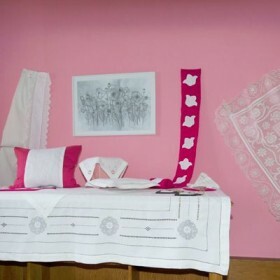 To emphasize the theme, I coloured one wall of the room pink. How beautiful the poppy field looks! 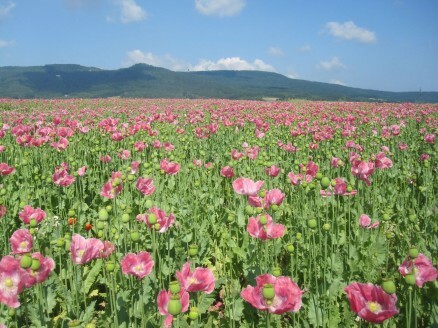 I and my mother loved that poppy, but nowadays if we plant them in Japan, the policemen come to catch us. 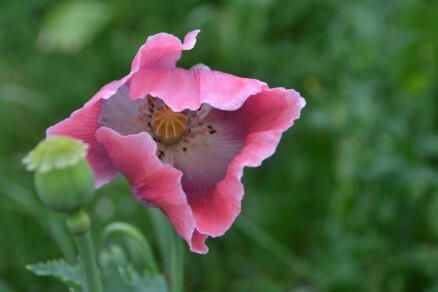 So I will enjoy them as the embroidery poppy which I saw at your blogs. Thank You for that . 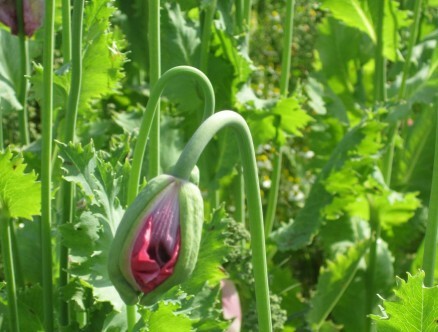 Here it is also not allowed to plant opium poppy. 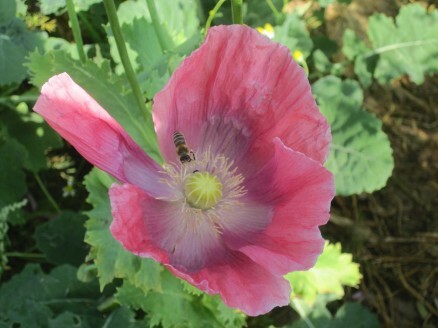 But the use of poppy is not only for opium – poppy seeds have a long tradition here for dishes and for oil. 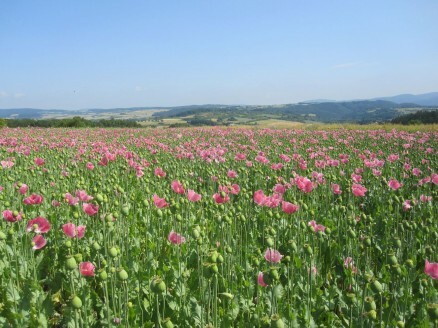 So the farmer got a special permission to cultivate it. He is controlled against abuse.